Don’t you love a good lime pie? Every bite is like a little burst of tangy sunshine in your mouth. I decided to try out a couple of versions not too long ago for my pie of the month auction winners, the amazing McDaniel family. Neither of these these lime pies has a graham cracker crust; I’ll save that version for another day. 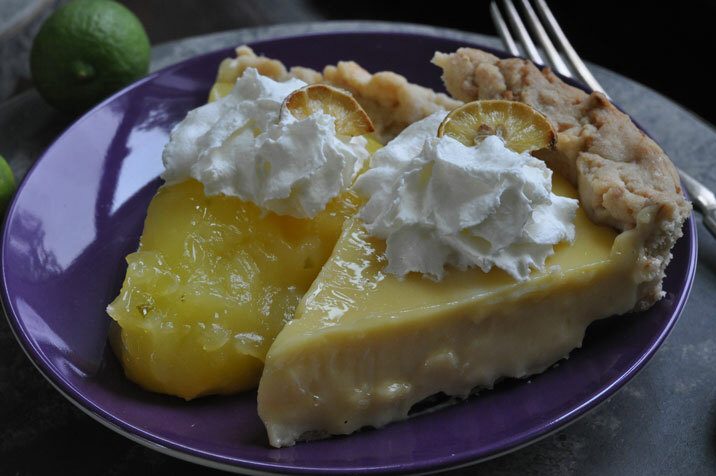 The first pie we’ll call key west lime pie I found in my treasured 1965 Farm Journal’s Complete Pie Cookbook. Imagine a lemon meringue pie with a lime filling instead of lemon- that’s this pie. Of course, I didn’t feel like making a meringue, so I just used fresh whipped cream as the topping. I had never had a lime pie made without condensed milk before…I really, really, really like this pie. The second pie we’ll call key lime pie, the condensed milk version. The filling is pretty much the standard condensed milk version. The crust is a Pate Sucree which is a little sweet, light and crisp….a little bit like a cookie. The children really, really like this pie. Combine cornstarch, sugar and salt in a saucepan; gradually add water, stirring until smooth. Bring to a boil over medium heat, stirring constantly and boil for a minute. Remove from heat and quickly add one half the hot mixture to the egg yolks, mixing well. Return to the hot mixture, blending thoroughly. Bring the mixture to a boil, stirring, over medium heat. Boil 1 minute longer. Remove from heat; stir in lime juice and peel and food color if using. Pour into cool pie shell at once. If doing a whipped cream topping, whip the cream with the sugar and vanilla until stiff. Cover the cooled pie completely with the cream. Refrigerate the pie. If doing a meringue topping, beat the egg whites with 1/4 t. cream of tartar, 1/4 t. of salt and 1/2 t. vanilla until frothy. Add 6 T. sugar a little at a time; beating well after each addition. Beat until stiff , pointed peaks form when you lift your beaters slowly. Spread meringue over pie filling; make sure you go to inner edge of crust to seal all around. Bake at 350 degrees for 12-15 minutes until the meringue is golden brown. Roll out and place pate sucree pastry in 9 inch pie pan, flute the edges. Bake at 325 degrees for 12-15 minutes. In a medium bowl, whisk together condensed milk, juice, peel, yolks and vanilla. Pour into the pie shell and bake at 325 degrees until set - about 15 minutes. Pulse flour, sugar and salt in a food processor until combined, about 4 times. Add butter, and process until mixture resemble coarse meal, about 10 seconds. With processor running, add yolks. Gradually pour in cream; process until dough begins to come together, no more than 30 seconds. Pat dough into a disk and wrap in plastic. Refrigerate at leas 1 hour and up to 2 days, or freeze up to 1 month.